The beginning of Advent is a magical time across Europe when Christmas markets overflow with Yuletide cheer. Many of the festive traditions we celebrate in Britain can be traced back to the famous Christkindlmarkts which sprang up in German-speaking towns as well as other regions of the former Holy Roman Empire during the Middle Ages. 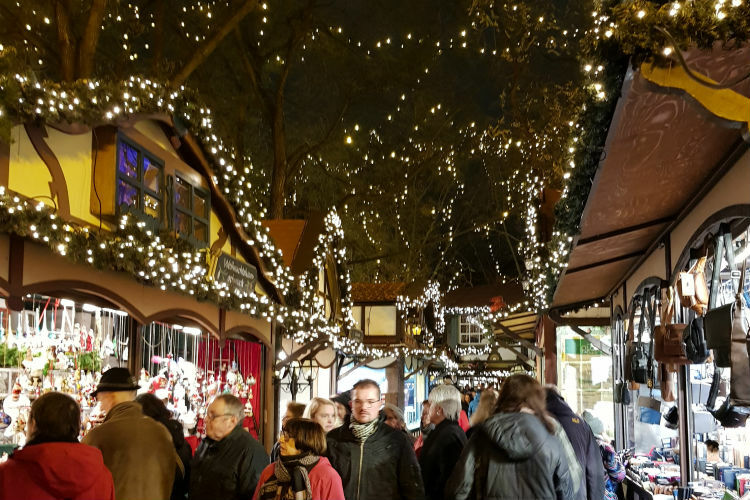 Today these festive markets, where bedecked wooden chalets are clustered together, offer an unrivalled chance to indulge in a cool Yule and there’s no better way to visit some of the most famous ones than on a Christmas markets river cruise. I’m not a particularly Christmassy person; to be honest I do a good impression of Scrooge once television becomes a succession of adverts for perfumes and play-stations. 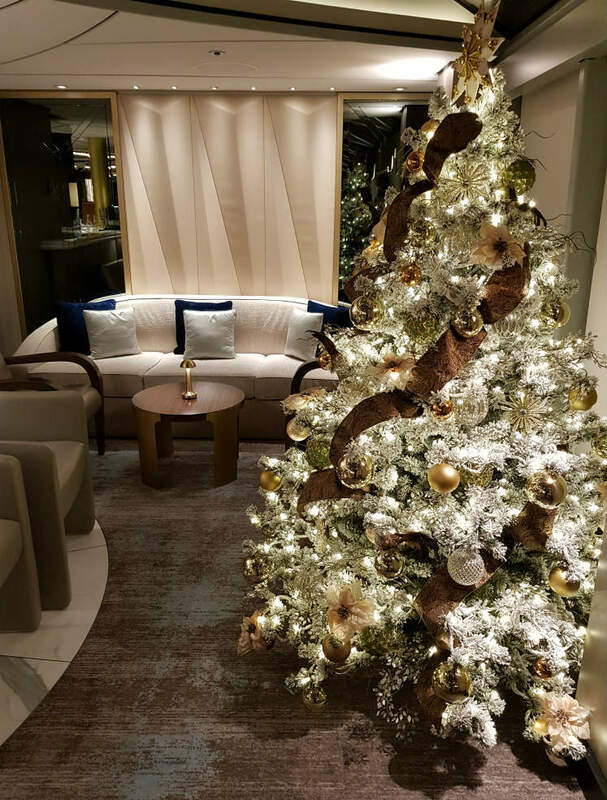 But this year I pledged to change my ways and shrug off the spectre of the Ghost of Christmas Past – and where better than aboard a festive ‘Christmas Time on the Rhine’ cruise aboard the luxurious Crystal Debussy. Embarking this festively-decorated vessel in Amsterdam I was immediately impressed by the lavish appointments and sense of space. 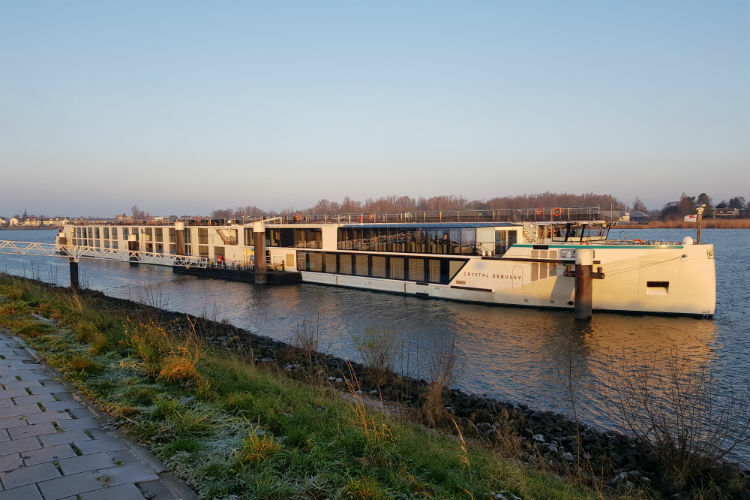 One of four identical sister ships – European river cruising’s only all-balcony, all-suite, butler-serviced river ships – Crystal Debussy entered service in April and has been cruising the fabled Rhine ever since. I’m an old hand at river cruising but nothing had prepared me for the aura of indulgence that exudes throughout this all-inclusive paragon. Conveying 106 passengers in consummate luxury, we were looked after by a convivial crew of 68 who understood guests’ preferences with unerring instinct. 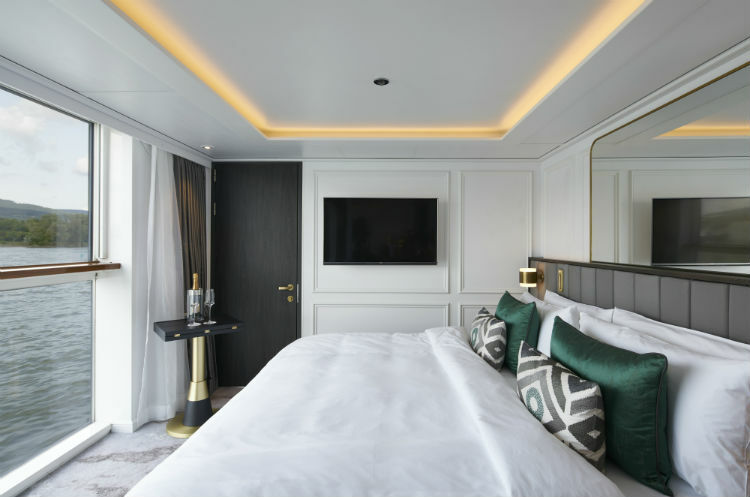 Crystal Debussy’s accommodations are the largest in the river cruise industry, with Standard Deluxe Suites at 253 square feet – 40% larger than the industry average, and the two-bedroom Crystal Suites measuring a generous 759 square feet. 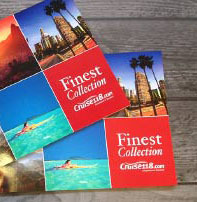 All categories of accommodations are situated above the waterline – another industry first. All suites come with butlers and feature king-sized beds with Panoramic Balcony-Windows and most have spacious wardrobes and walk-in showers. 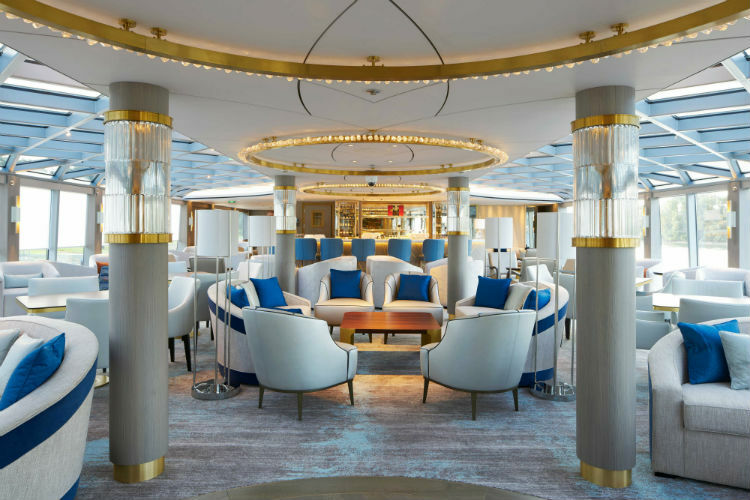 The elegant, glass-ceilinged Palm Court is the social hub for afternoon tea, cocktails or the most sophisticated entertainment on the rivers of Europe. Dining in the Waterside Restaurant is a culinary delight, never more so than at dinner when award-winning à la carte offerings include a Michelin-inspired modern-tasting menu alongside classical, regional cuisine. The Bistro serves light snacks throughout the day while in the evening it transforms into a globally-inspired tapas-style restaurant. In the Vintage Room guests can indulge in a variety of wine-themed lunches or dinners featuring fine wines and champagnes. There’s also a 24-hour Pantry offering coffees, teas, wines and soft drinks. The pop-up Vista Bar on the Top Deck is a great place to hang out during warm weather cruises but not in December, so the indoor heated pool and Crystal Life Spa came into their own as we meandered along the Rhine. Amsterdam kicks off the festive season in November when a 65-foot tree is illuminated in front of the Royal Palace on Dam Square. There’s also an ice-rink in front of the Rijksmuseum and a veritable village of wooden chalets serving olibollen donuts and mulled wine on the Museumplein. Our next port of call was Antwerp, here I headed to the Christmas market in the Grote Markt and ambled all the way to Het Steen Castle glowing with blue lights. With temperatures hovering below freezing I sampled some smoutebollen – beer-scented fritters dusted with sugar as well as Belgian waffles with hot chocolate. The next day we visited Kinderdijk, where 17 UNESCO-listed windmills enhance the pastoral scene. Cologne is undoubtedly the mother-lode of Christmas markets with no fewer than nine communities of wooden stalls illuminated with twinkling lights. 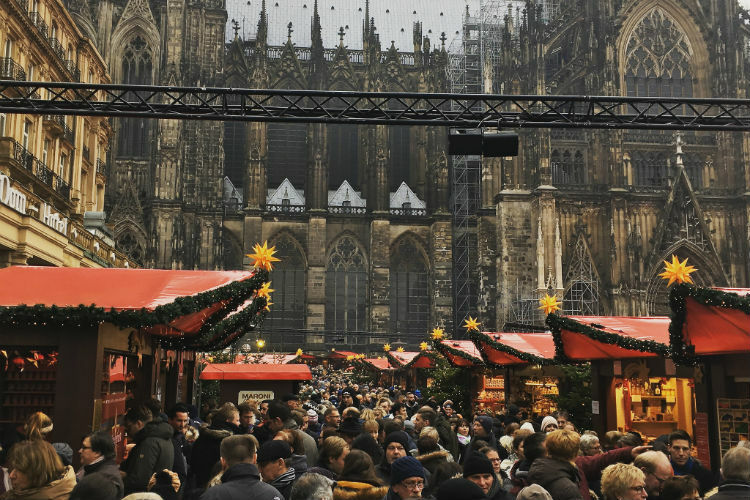 The city’s imposing gothic cathedral – the Dom – provides an impressive backdrop for the 160 tastefully-decorated stalls which are draped by a huge canopy of sparkling lights. There’s also the largest Christmas tree in Rhineland. 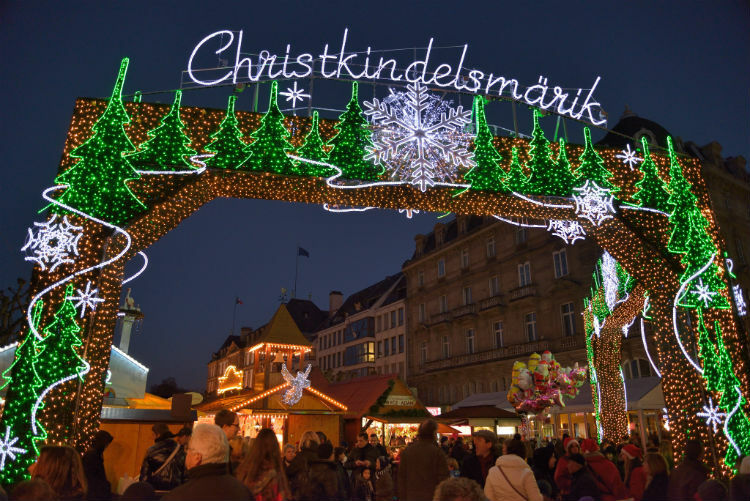 The Alter Markt has a Santa Grotto; while the market in Rudolfsplatz has a fairytale theme. 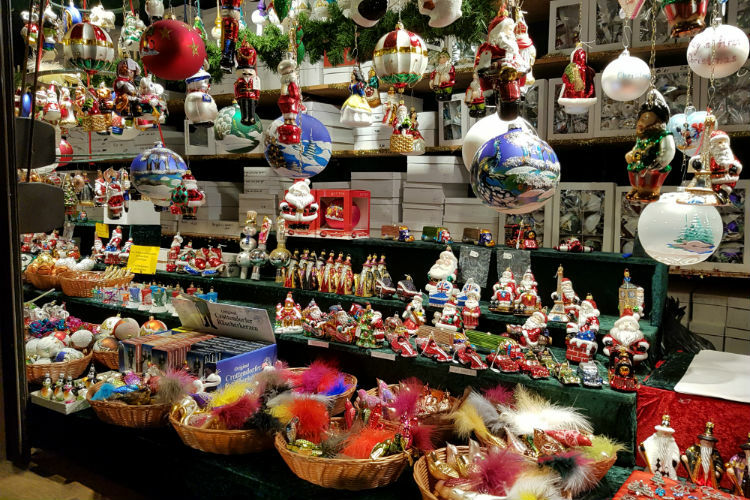 These Yuletide havens are the perfect place to sip some warming Glühwein, sample traditional Bratwurst sausages or Weihnachtsstollen – made with candied and dried fruit, nuts and marzipan; before stocking up on unusual Christmas gifts and novel decorations. This blissful ten-day cruise from Amsterdam to Basel also visited the walled city of Koblenz, dramatically situated at the confluence of the Rhine and Moselle Rivers, where the Christmas market stretches through the historic old town. Continuing upriver, past the spectacular Rhine Gorge, Crystal Debussy docks at the quaint wine town of Rüdesheim where the Drosselgasse is a study in twinkling, festive lights. A fitting finale is Strasbourg where the largest and oldest Christmas market in France is spread across Grande Île – an island in the historic centre of the city dominated by the imposing cathedral with its filigree spire. It’s a magical scene that would even impress Scrooge. Sailing along some of the world’s waterways offer the perfect opportunity for Christmas joy, take a look at our latest Christmas markets river cruises by clicking the link below, or call our Cruise Concierge team on 0800 197 0854 for expert advice on your river cruise. Would you like to spend time on a festive river cruise? Have you sailed with Crystal River Cruises before? Let us know in the comments below!